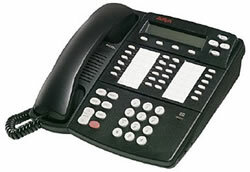 The 4412D digital phone is a 12-button digital telephone designed to provide the most common phone functions required to achieve maximum employee productivity and overall value. 12 Programmable call appearance/feature keys with twin lamps. 12 Programmable feature keys without lamps (ie. not suitable for call appearance features). 8 Fixed Feature Keys: Speaker, Mute, Conference, Transfer, Redial, Hold, Volume Up/Down. DSS port to support 2 DSS4450 adjuncts; Auxiliary power required.